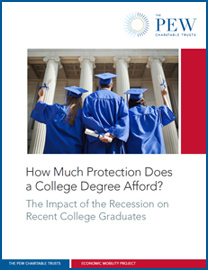 Does a college degree still help protect against an economic downturn? According to the latest research from Pew’s Economic Mobility Project, the answer is a resounding yes. 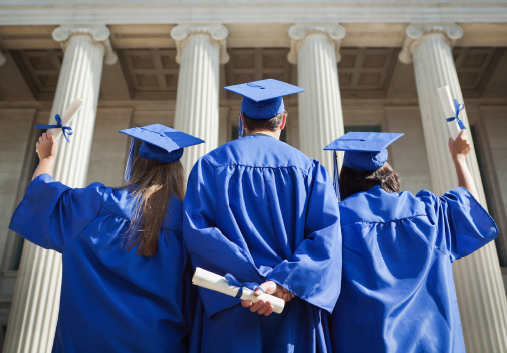 The study, The Impact of the Recession on Recent College Graduates, reveals that a four-year college degree helped shield the latest graduates from a tough job market during the last recession and its aftermath. The study found that young adults did not lose nearly as much ground as their less-educated peers during the recent economic decline. Among Americans age 21 to 24, the drop in employment and income was much greater for those without a college degree. Past research from Pew’s Economic Mobility Project has shown the importance of a college degree in helping to advance upward mobility and prevent a decline in economic standing. The chances of moving from the bottom of the family income ladder to the top are three times greater for someone with a college degree than for someone without one. Furthermore, when compared to their less credentialed peers, college graduates benefit from higher earnings and lower unemployment rates. Before the recession, just over half of young adults with a high school degree were employed, compared to almost two-thirds of those with an associate degree and nearly three-fourths of those with a bachelor’s degree. During the recession, employment gaps widened even further. Those with high school and associate degrees saw employment declines of 16 and 11 percent, respectively, compared with only seven percent for those with a bachelor’s degree. Four-year college graduates also saw a smaller decline in wages during the recession with a five percent drop in wages, compared with a 12 percent decrease for those with associate degrees, and a ten percent decrease for high school graduates. At a time when many question the value of a college degree, Pew’s research confirms its financial worth in terms of both higher wages and greater employment rates. “This shows that any amount of post-secondary education does improve the labor market outcomes for those recent graduates,” said Diana Elliott, the research manager for Pew’s Economic Mobility Project. 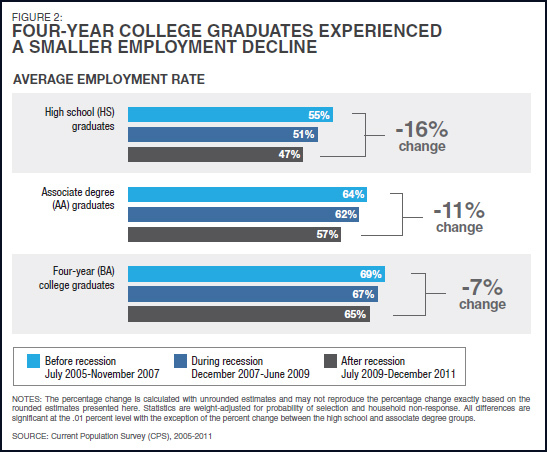 To download a copy of the full report, The Impact of the Recession on Recent College Graduates, visit www.pewstates.org.